When you take a look around the lowcarb / paleo / primal community, you probably will see that people are loving their nuts and seeds. Recently nut and seed butters have become really popular. The downside is that good quality nut butters without cheap oil or sugars added can be quite expensive. So here is recipe how to make them yourself. This could not be any easier! It’s so simple I wouldn’t even call it a recipe. Depending on your taste, first you roast the nuts or seeds. You can skip that step if you want to, I personally like mine roasted. Or you can buy your nuts or seeds already roasted from the store but make sure they haven’t added any cheap bad quality oils, sugar etc. To roast the nuts, heat your skillet to medium high heat. Then place the nuts or seeds in there and constantly mix. Once the nuts are fragrant and golden, they are done. It’s easy to burn nuts and seeds, be careful. Let them cool a little. Remove any shells or skins that might start to come off (hazelnuts, almonds and some other nuts will shed skins, remove them by rubbing the nuts in a kitchen towel). Now put your nuts or seeds in the food processor (with the S-blade) and blitz away. Different nuts and seeds take different amounts of time. Sunflower seeds are one of the quickest to turn into a butter, almonds take significantly longer. You should mix everything with a spoon every couple of minutes to make sure nothing sticks to the sides. Don’t let the nuts and seeds fool you: once they already look like butter, keep blitzing. They will release more oils and get even better. But if you like your butters crunchy, don’t mix that long. When you have a smooth paste or butter, add seasonings if you want to. I usually add a pinch of salt to peanut butter. You could add dark cocoa powder to hazelnut butter to make a lovely healthy Nutella. Or you could try nut butters with cinnamon, cardamom etc. Have fun trying different combinations! If you feel like the butter is too thick in the end, add a little bit of oil and let the food processor mix that in. It will make the butter more liquidy and easier to spread. I usually add a little olive or coconut oil to all my butters because I don’t like mine too thick, I like them on the runnier side. Peanut butter, hazelnut butter with sweetener and dark cocoa and almond butter. 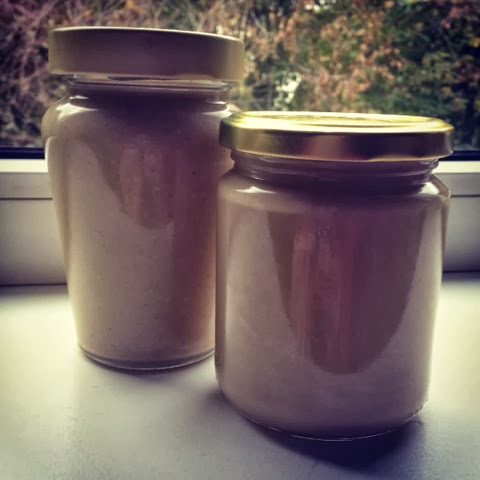 And there you have it: homemade healthy nut or seed butter. Put it into a (pretty) jar and enjoy! You can check the nutrition info about all sorts of nuts and seeds in this post. Depending on how much oil and seasonings you add, the nutrition info will change a little bit but you can get pretty accurate idea of nutrition from the post linked before. If you have any great tips or flavour combination recommendations for me, let me know in the comments.